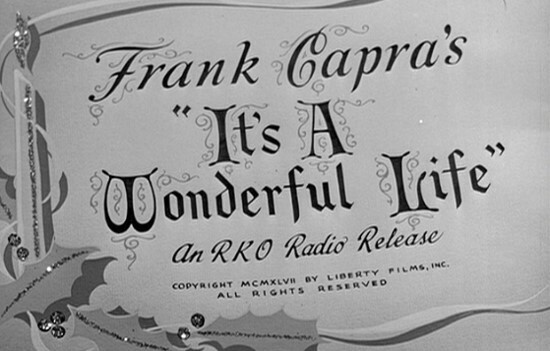 The experience of It's a Wonderful Life stems for the most part from the atmosphere and portrayal of a 1940's small town. 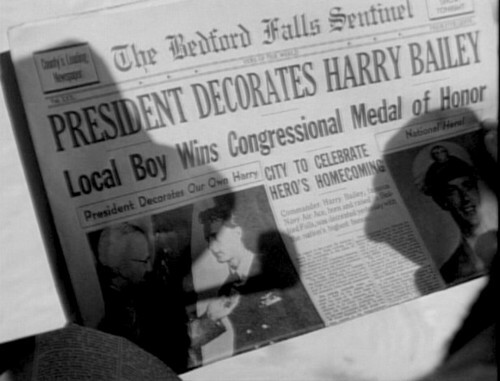 The aura given off by the people and places of Bedford Falls, creates a character that you don't hear or see, but can feel throughout the film. Maybe it's my biased feelings from too many Westerns but I feel that Bedford Falls, like so many small towns revolved around it's church(es). We see the main street often enough and we've visited there many times, but a church is not seen except for a few instances of stairs and doors and some brief shots of worshipers walking in. 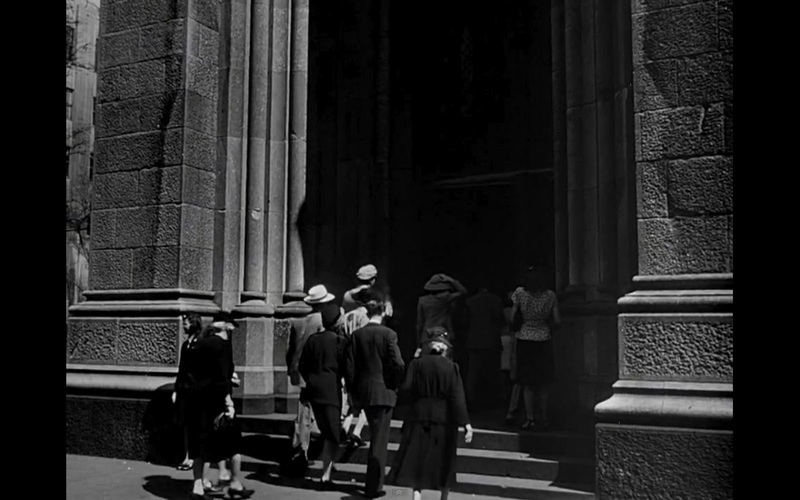 Before that though, at the very opening of the film we see a large bell ringing. One can assume, that this is a church bell. 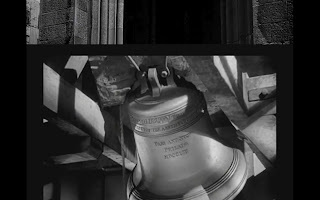 But, the bell does have the markings of being a replica of the famous liberty bell with is transcriptions. If that is the case, would a church cast a copy of such a bell? 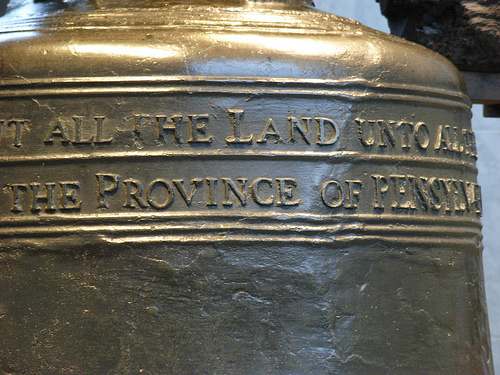 The Liberty Bell does have in addition to other things a bible verse imprinted on it, so it's possible. 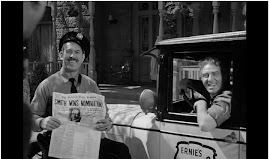 VJ Day famous photo that has the same IaWL 'aura'. 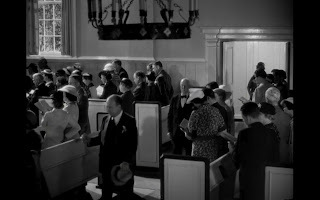 The few church segments all revolve around the towns people entering the various houses of worship for day's of prayer and thanksgiving during and after the war. 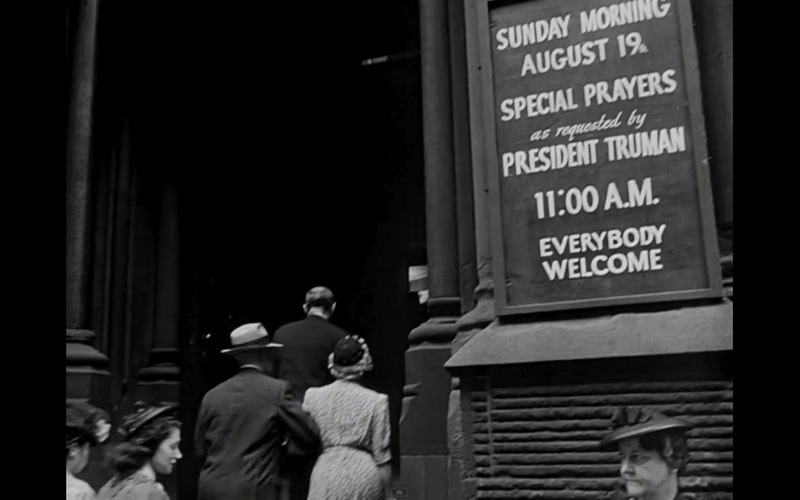 Included in the shot is parishioners walking on a Truman's declared national Day of Prayer on Sunday August 19th, 1945. The day was in honor of the conflict finally ending after the Japanese surrendered. He declared the day by proclamation. You can read the entire proclamation here. At least two churches are visible in the shots, one of which seems Catholic while the other simply Protestant. I'm not versed enough enough on denominational architecture to offer more of a guess than that, so you can be the judge. To the left is the Catholic looking interior. Pretty spectacular site. Considering Catholics make up around 40% of New York state's population, I consider this a safe bet. Surprising Protestants only make up about 30% of NY. 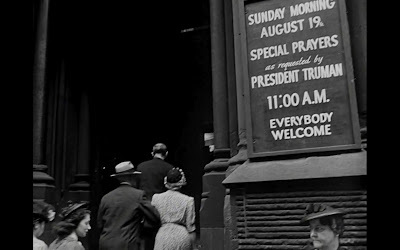 (Modern Statistics) It's just an assumption but I want to connect the shot of the church's welcome sign and this sanctuary as well. 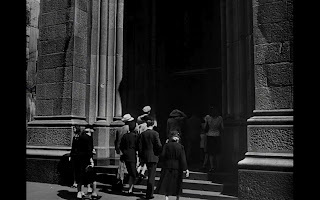 The last image we see below, is another exterior view that perhaps is another church and perhaps just the entrance to one of the interior we've already seen. I'm open to any suggestions as to what could tie or distinguish it to one or the other. 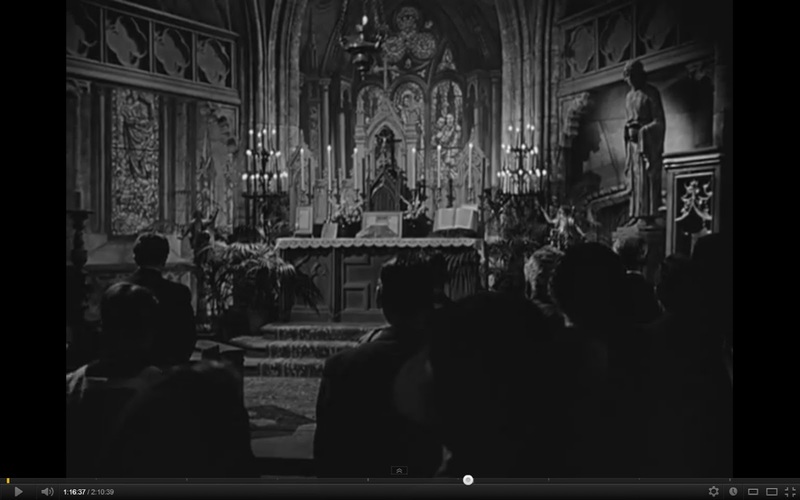 Either way, Bedford Falls is happily well stocked with churches. George claims "Dear Father in Heaven, I'm not a praying man,but if you're up there and you can hear me, show me the way. I'm at the end of my rope. Show me the way, God." so we know that it appears he that although perhaps not a regular (at least prior to Clarence's visit anyway) church goer, if he did do his prayers then they would have been in one of the buildings glimpsed above. Assuming the wedding took place outside of his mother's house, he likely was married there as well. Moving onto the Enesco version of the Bedford Falls church, we see they took a path and model that has its good and its bad. For village, especially a CHRISTmas village the church likely should be the centerpiece. A community building that easily outweighs a City Hall or school in terms of its meaning to the town as a whole. Here is the Enesco church for the It's a Wonderful Life village. First the unboxing. This piece is the 3rd of 4 in the great 3rd series. It's size is a good thing, as the steeple should and needs to stand out above the other building. Sadly I believe it needs a couple more inches. Enesco Bedford Falls Church: Rear side. Nice image of the first 3 sets together. Click the 'Read More' to continue with the rest of the images. Now some shots of the piece in the light. Captions should offer some small additional thoughts. Enesco Bedford Falls Church: Front Face. 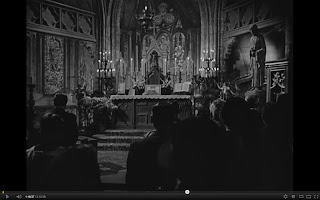 Single door tells us that this isn't a church we see in the movie and apparently Enesco thinks that a much smaller more rural looking church set the feel more than what the film shows us. Enesco Bedford Falls Church: Closer front shot. Stain glass windows are a nice touch, as is the small over hang above the door. Enesco Bedford Falls Church: Front door shot. Enesco Bedford Falls Church: Church bells ... or I should say bell. 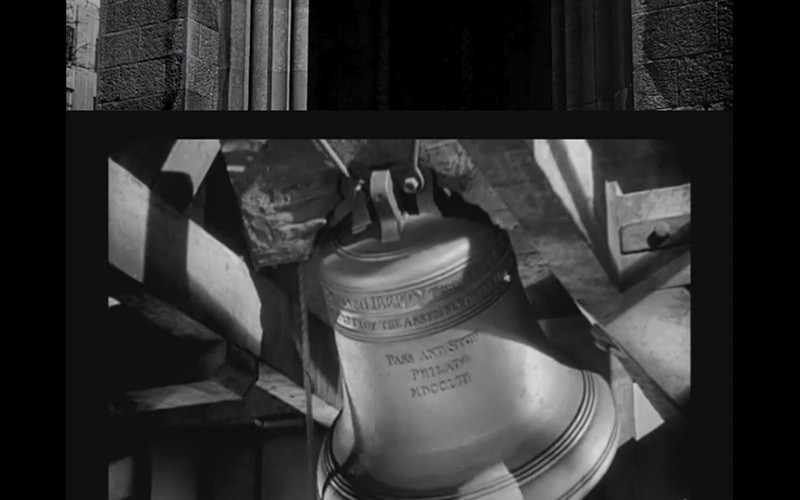 Are we to assume that this is the bell we see at the beginning of the film? Again, Enesco seems to have dropped the ba(e)ll as I think not. Enesco Bedford Falls Church: Church fence. Enesco Bedford Falls Church: Side view. George: "Yeah, I got a bust in the jaw in answer to a prayer a little bit ago." Clarence: "Oh, no –– no –– no. I'm the answer to your prayer. That's why I was sent down here." What is the value of this church?